The Genesis Class is a class for engaged and married couples, for twenty and thirty year olds. They have various teachers who lead them in studying a variety of topics, from Biblical lessons to contemporary Christian issues. The Genesis Class is committed to growing together in faith through learning, service and fellowship. We meet at 11:00am in Room 205. Thanks to Daniel C's generosity and organization, we enjoyed a fun night at Dr. Pepper Ballpark last Saturday watching the Rough Riders crush the Corpus Christi Hooks 11 - 2, and we ate a lot of hot dogs! Christy has been leading a series called When Christians Get it Wrong. It is a great series by Adam Hamilton and has spurred lots of great discussion...so much so that we had to finish last week's discussion this week. This week Kristin will lead it as Eve is being baptized at 9:45. We need people to volunteer to lead class. Kristin has found lots of materials so that part is already done unless you have something you want to discuss. The current series will run through at least May so we need people starting in June. Connie Presley is in need of Summer Sunday School teachers. We have helped with this the past two years. It gives the regular teachers a break, and everything is provided for you. She needs help with all ages at all hours on all Sundays of the summer. Let me know if you can help. She needs 10 teachers on the following Sundays at 9:45 so if there is a popular one, we will cancel class and help. 1. You will need 10 volunteers to go on your Sundays to serve and do the variety of tasks. 2. Each Sunday will have 2 coordinators who will meet you in the south parking lot of the church at 3:00 p.m. and drive you to St. Paul UMC on the church bus and back. 3. The coordinators will direct the servers as to tasks that need to be done during the afternoon, including handing out toiletries, cleaning the tables, serving the food, sweeping and mopping the floor, taking down tables and chairs, haul out the trash at the close of the day. 4. Each class will be responsible for giving a devotional before the meal. This does not need to be long, maybe 5 minutes, but should be careful to be appropriate for our clients ? homeless people without material possessions. There will be a speaker system you can use to give the devotional. 5. You should return to the church by 6:00 p.m.
August 21, October 16, December 18 are our other dates. If you already know you would like to go on one of these, let me know. I am working on the next social as a family picnic. We discussed early June, but I don't think I can swing it so maybe September. I will send out more information soon. Daniel C's dad continues to have a difficult time with his health and is in a lot of pain. Matt will be completing his 1st Iron Man in the Woodlands this weekend! Matt and Christen joined the church last Sunday. We had a great time attending the Frisco Roughrider baseball game! We had two visiting couples this Sunday, which made total attendance 25 people! I'm pretty sure Jeff W. was jazzed about this! Eric and Sara grew up in the area, have a daughter, and recently joined the church. Matt and Christen live in Lake Highlands, have a son, and have been visiting FUMCR for awhile. We were really glad to have both couples in class and hope to see them again soon! Heath will teach the final lesson in the John series this Sunday. If you haven't experienced one of Heath's lessons, you should really come check it out. February 20, we will join Ed Frantz across the hall in Room 203 at 11am for a 3 week course Profoundly True...Sometimes Factual. We will explore Bible stories that may be too difficult to accept as fact, but hold profound truths for our lives today. 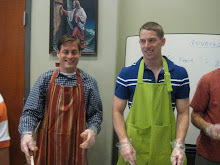 Missions: Body & Soul, which is a soup kitchen downtown at St. Luke's, should start in February or March. Our class is responsible for filling the volunteer server spots every other 3rd Sunday of the month so start looking at your calendars. Let me know if you have any other ideas for mission projects. Socials: Daniel C. has offered to organize a Frisco Roughriders baseball game this Spring. He says the best date would be Saturday May 14th. He did some research and found that there are some fairly reasonably priced group tickets near the bullpen. The cost would be $10 for the ticket, and $7 for all you can eat food, for a total of $17. They have been several times, and it is a great family friendly place. Jeff and I are also happy to host the family picnic social that we discussed last year. We have a large field at the end of our cul-de-sac with a park for kids to play and a lake where we can do a little fishing or feed ducks. We can bring our grill out and do a picnic potluck and maybe some games/let the kids run and play. Daniel and I were discussing how we might fit both of these in before it gets too hot. He said there are other options for the game date, and Jeff and I are pretty open as far as dates in May and June. Let me know your thoughts on this. I hope you are all staying warm during our third snow experience this season!! 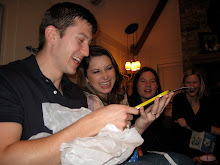 Here are a few photos from our annual After Christmas party, where we exchange our "worst" Christmas gift received that year. A white elephant exchange after the bustle of the holidays. If anyone has more photos, please send them to Christy C. and I'll post them. Heath led a discussion on John 7-9 last Sunday. The discussion was focused on Christ’s healing of a blind man and the aftermath of the miracle. As usual, John describes surface level events with a spiritual parallel. We plan to focus on John 10 and 11 next week if you want to read ahead. Our class size has held steady lately around 15 or 16 people which greatly increases the enjoyment and depth of conversation so we hope you join us soon if you have been out for the holidays. The Intentional Faith Development Team and Dr. Oliphint are asking us to participate in a church-wide study called 24 Hours that Changed the World by Dr. Adam Hamilton. We have used some of his stuff before. It is a seven week study March 13th - April 24th and examines the last days of Jesus' life and how his death changed the world forever. We will be provided with the materials necessary for this series; however we have been asked to send 2 representatives to a curriculum meeting on Sunday, january 23 at 11am or Thursday, January 27 at 6:45pm. Let me know if you would like to represent us. This does not mean you have to teach the whole thing. Brad & Kristin did this last year, and it was an interesting series. There are enough lessons in our John series to take us through February and half of March and April are taken up with the church-wide series so if you would like to teach, the materials are already prepared. We also need 2 or 3 volunteers on February 20th to help with "Clean Out the Cabinets" Sunday in order to tidy up the classrooms. Jeff & I will be there, and I'm sure the more help there is the faster we will get everything tidied up. Socials: Our after Christmas party went well with many “interesting gifts” exchanged. Thanks to Brad & Kristin for hosting! Since we will not be having a social officer, whoever would like to propose the next social is welcome to head up whatever you would like. I propose that we have at least one social per quarter so that would mean April, July, and Octoberish at least. Missions: Brad M. has offered to oversee this as the contact person, but just like the socials all are welcome to lead or suggest a project. We are looking forward to another great year with the Genesis Class! Heath led us in yet another riveting discussion on John. We discussed the often quoted “Let he who has no sin cast the first stone” statement made by Christ when confronted with an adulterous woman. As usual, the depth of conversation far exceeds what one might think of alone. Next week focuses on John 9-10 if you want to read before class begins, and we will finish the video for this week since we ran out of time. The after Christmas party is next Saturday starting at 4pm at Brad & Kristin's. Please RSVP with them as soon as possible and include the potluck dish you plan to bring. The gift exchange starts at 6pm so make sure you bring a white elephant gift individually or as a couple. have been invited to join the Twenty Somethings if we choose. Winter Fest is Saturday, February 5th. I need to respond to the coordinator by Tuesday. She needs volunteeers for 7:45 - 9am and 11 - 12:30 still. Courtney and Kristin have volunteered for the second shift so far. It is the time of year where officer changes occur. The class has elected to have minimal “officers” in order to circumvent the assumed authority in the class. Basically we are breaking the officers down to a president, co/vice president (to assist in the president's absence and however else they choose to divide responsibilities), and teaching coordinators with one overseeing the big picture of teaching. Brad Shipman has volunteered to keep the hospitality portion of the class, and Heath and Courtney have volunteered to be one of the teaching coordinators. Presidential duties are not difficult but they do require diligence so please discuss the responsibility with your spouse. I can say that it has been a rewarding experience, and I would encourage anyone with the desire to take the reins. The president duties basically include announcements and attendance in class and communication between the class and church administration or people requesting our assistance and with the other officers. The president has also assisted with coordinating socials, missions, hospitality, and lessons in the past, but we are hoping that the overall teaching coordinator will take care of the lesson part. We are happy to have as many teaching coordinators as are interested, and once we know who all is interested they can decide how to divide the year. We will begin the transfer of responsibility in early February, but we will need candidate offers within the next two weeks as the church has requested contact information for all classes so please begin thinking of this soon and respond ASAP. Daniel and Kimie are in their second trimester! She is due in June! Courtney's friend Trica has been diagnosed with stage 3 cancer and will have to be treated with chemotherapy. Brad's cousin will have to have surgery for the growth on his pancreas, but it was benign. I hope everyone had a wonderful Christmas! We are looking forward to 2011 with the Genesis Class! Last year, we handed out candy canes but it wasn't very successful so this year we just welcomed the troops as they passed through. There were over 200 troops coming through DFW on this plane that morning and a small crowd to greet them. This is a fun event we all enjoy doing, and look forward to doing it again next year!